Gamma knife surgery is a type of radiation therapy, which utilizes highly sophisticated equipment to focus around 200 tiny beams of radiation on a tumor or other target with high accuracy. It is primarily used to treat benign brain tumors, craniopharyngiomas, AV malformations, pituitary adenomas, acoustic neuromas, brain metastases, other tumors of the skull base, and pineal region tumors. Most stereotactic radiosurgery procedures in adults are performed without anesthesia. 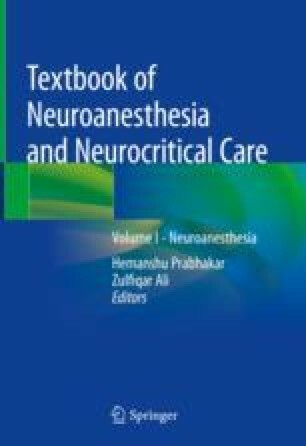 However, general anesthesia is frequently required in the pediatric population and in some of the uncooperative adult patients. A stereotactic frame is applied to the patient for accurate site and positioning of the lesion to radiations. The advantages include incisionless surgery with minimal morbidity and reduced postoperative hospital stay and reduced expenditure. The problems encountered by the anesthesiologist are administration of sedation or anesthesia at remote locations, intrahospital transfers with all the monitoring to different suites, long duration surgeries, hypothermia, etc. All necessary equipment should be present at all the locations beforehand to ensure safe administration of anesthesia. Prior preparation and effective coordination between all the concerned specialties involved is the key to make anesthetic management of this procedure a success.